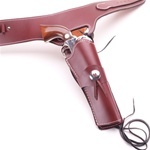 The Tri-Vertible Holster is in a class by itself when it comes to comfort and versatility. It adjusts easily and can also be configured for left hand shooters. The Mag-Jic Holster is a paddle holster that works like magic - with magnetism. It requires no belt. It's fast on and off.